Caption slip reads: "Photographer: Emery. Date: 1953-01-25. Reporter: Emery to Fiske. 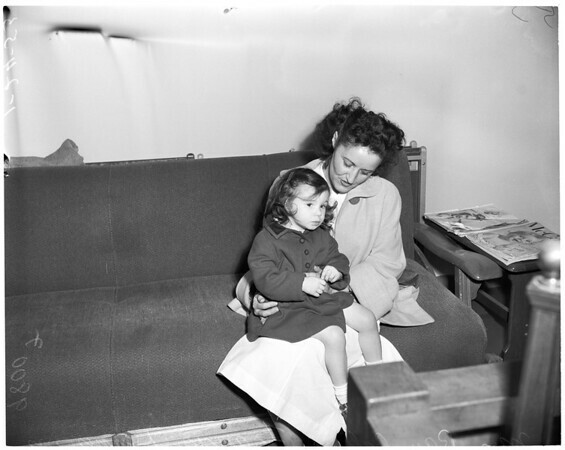 Assignment: Baby selling case, Long Beach (Pix in Juvenile Bureau quarters). 42 & 48: Mr. & Mrs. Ray Coley (Mrs. Velda Coley) 4849 N. Adenmoor, Long Beach, with baby Frances Haynes, 3 yrs., alleged 'sold' to this couple. 52-53, 98: Mrs. Coley and Frances (as above). 66, 56-57: True parents of baby, Mr. and Mrs. Charles E. (Viola) Haynes, 1771 Cherry Ave., Long Beach, who changed minds and wanted baby back."